Westlife's Shane Filan would welcome Brian McFadden back to the band "some day". The 32-year-old singer - who last year insisted he would not be interested if Brian, who quit the Irish group to go solo in 2004, came back - said he would not "rule out" a return for his former bandmate after witnessing the recent success of Take That following their reunion with former member Robbie Williams. 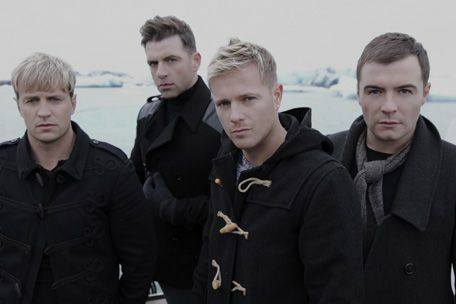 Shane - who is joined in Westlife by Kian Egan, Mark Feehily and Nicky Byrne - told the Daily Record newspaper: "I look up to bands like Take That who are the best out there and it was good to see them put the past behind them and move on by having Robbie back. "I'd never rule out Brian coming back because there never was a bad patch with him. Brian was great with fans. "I definitely think some day it would be great fun to sing with Brian again. It could be in 10 years time but I think it will happen." Last year, Shane announced it would not be "remotely interesting" if Brian returned to Westlife after the 'Australia's Got Talent' judge revealed he had dreamt about being back on stage with the group. Brian wrote on twitter in November: "I had a dream I was back on stage with Westlife playing some crazy-sized football stadium." Shane responded at the time: "I don't think it's even remotely interesting if Brian came back."